Reading about it is one thing. Being there is entirely different. Linett records what she finds in lands far from Bree, but you really ought to see it for yourself. 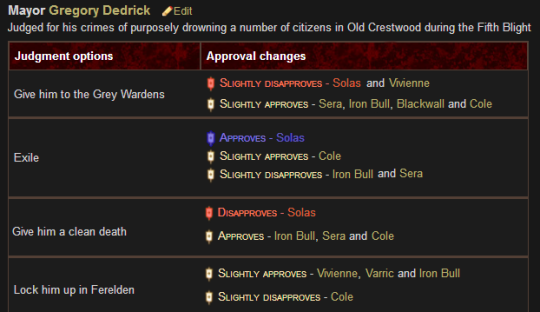 You have to judge the mayor of Crestwood for pretty much the same thing that Solas is responsible for (albeit on a much smaller scale). I couldn’t have written a closer parallel if I tried – the mayor, in a position of authority, made the decision to unilaterally kill many innocent people in order to stop something he believed to be more terrible from happening (eta: and both were, perhaps, attempts to specifically stem the spread of the Blight – thank you for catching that, @rederiswrites!). Then living with guilt for years, all those deaths on his hands, wondering if he made the right call, until finally the truth was revealed. Where it gets interesting is when Solas reacts to the Mayor’s punishment. And his reactions are almost the complete opposite of all the other companions. Solas seems to be the only person who actively empathizes with the mayor. He thinks the mayor deserved exile, is neutral about imprisonment, and he is the only one to disapprove of a beheading. That Solas would approve of a betrayer being exiled away from his people is interesting to me, especially knowing his worst fear (“dying alone”) and hearing the conversation with Varric about the Man on the Island. I wonder if these are the same punishments he would give himself. Anyway, I get a kick from all the people in the comments saying that they just felt sorry for the mayor having to make a choice like that… does that go for Trespasser as well? So there are all these parallels between Solas and the Maker, right? So what if Andraste’s message was misinterpreted over the years (and via wartime propaganda even during her own life) and the Bride of the Maker was actually a prophecy? Referring, of course, to a woman who would win the Maker’s regard so highly that she stopped him from condemning the other people of the world to suffer for their sins. Not Andraste herself. A vision she saw, of what would need to happen in order to stop the end of the world one day. Ok whoah, @feynites you are blowing my mind with this! I actually like it a great deal. Far more than I should because it gives me hope of redeeming the Egg. I always respond rather understandingly to the young Crestwood couple hiding in that dank old place where you go to ‘empty the lake’ or whatever.. but god I love that scene so much.. Taking Solas along, he always goes something like “oh…..wonderful” >:/ in the most displeased manner.. its downright hilarious.. Such a critic, hes a true romantic at heart. Disapproves of a youngin` that doesnt properly put intent or well thought out meaning into someone he courts..
Solas himself probably imagines a hundred different better romantic places then that.. at that precise moment..
u gotta think that solas who utterly loathes the inquisitor has to feel happy as a clam and really really not that torn up about his plan. TRA LA LA THESE PEOPLE DON’T MATTER AND MOST OF THEM ARE ASSHOLES I’M JUST GONNA PUT IT TO RIGHTS. This is the most interesting (terrifying, wonderful, thematically relevant) thing in that game, right?? Like, how different Solas feels about the world, about his situation, if you’ve never, ever, once made the effort to reach out to him. How hard and closed his heart is. And what changes and blooms if you just effing empathize with and speak to and listen to a person who needs it. If you show love for a person who is obviously crying out for help. Patrick Weekes always spoke about Solas with such gentle tender compassion, and now I understand why. What shocked me coming into the final stretch of Trespasser was that, FORGET about the flea distraction that is the Saarebas, the conversation you have with Solas is the Last Boss Fight of Inquisition. And, in a first that I’ve encountered in a video game, it’s a final confrontation lost or won purely through empathy. Solas is desperately asking the Inquisitor to listen to him, to help him, to stop him. He would never have told you anything if he didn’t want you to stop him. It’s a quiet conversation, full of pain, and it’s more climactic than all the fighting in the last 10 hours of gameplay put together, including Corypheus. This conversation is the most climactic final boss I can remember playing in years. And the game rewards you for your patience and empathy, your friendship. The connections you made opens up options, gives leeway for peace and healing. It’s probably not going to happen, but in the next game I would hope that, in world states where the Inquisitor cut Solas off or physically abused him, that it’s fully 6 times harder to beat the game. I hope that helping Solas come to terms is a genuine method of beating DA4. The information the Inquisitor has access to if they stop to listen to Solas is like 150 times as useful as one who always told him to shut up. And Solas wants you to use that information. In the good ending of this game, he’s so desperate that you do so. In the bad ending, he’s an island. This is beautiful. How could I not have noticed this theme of empathy and/or compassion when I’ve been playing to it the whole time? Click the button for reports from the 2010 Spring Blogger Gathering, hosted by Linett of Nimrodel! Berethron of Brandywine hosted the 2010 Summer Blogmoot. The Winter Blogmoot was held on December 4, 9 p.m. EST at the home of Telwen of Silverlode. Next up: The Spring Blogmoot of 2011 shall return to Nimrodel with Tuiliel (Whart, aka user-1027520) hosting! Linett is looking forward to another local moot!